Movie Review: Once there was a masterpiece called “My Dinner with Andre” that consisted of two men engaged in conversation about their lives while seated at a restaurant table. Well, that movie, directed by Louis Malle and written/acted by Andre Gregory and Wallace Shawn, somehow came to my mind while watching “The End of the Tour”, which doesn’t match the brilliance of the cited, but is assuredly a great film. The reason for this resemblance, is that this compelling drama about the real short-term relationship between two novelists, David Foster Wallace (Jason Segel), who enjoys an incredible peak of fame after the launch of his acclaimed novel ‘Infinite Jest’, and his fellow interviewer and Rolling Stone reporter, David Lipsky (Jesse Eisenberg), relies almost totally on their engrossing conversations. The film, directed by the diligent James Ponsoldt (“Smashed”, “The Spectacular Now”) from a Donald Margulies’ screenplay, was based on Lipsky’s 2010 book ‘Although of Course You End Up Becoming Yourself’. Lipsky, is one of those committed men, eager for a good story, who leaves NY for a five-day tour with the secluded and enigmatically talented, Wallace. The attempts to figure out the latter’s character, which is a complex mixture of prominent ego, legitimate modesty, shyness, and solitude, play a fundamental factor to keep us avidly watching the ups and downs that arise from the protagonists’ interaction. The pleasure of gradually discovering each other suddenly takes a sour detour. At this point, they recognize not only the virtues of their humanity but also the faults, impossible to discern by reading a thousand-page novel. 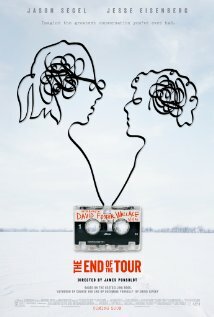 “The End of the Tour” is a subtle, genuine, and beautiful accomplishment whose enthrallment is as memorable for the viewer as the experience was for Lipsky. The film was a great opportunity for Segel to shine outside the comedy circuit and to confirm Eisenberg as one of the most solid actors of our days. Ponsoldt and Margulies were intelligent enough to set up a suitable narrative scheme to make the story work.